Here at Fun Kids we love reading! And this summer McCain Smiles and the National Literacy Trust are launching a massive campaign where they’ll be giving away more than 100,000 Ladybird books for free with packs of McCain Smiles. 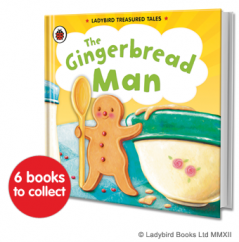 The six Ladybird books are all classics, including Cinderella, The Three Little Pigs and Little Red Riding Hood, and are great for to read with parents or for kids to tackle on their own. The campaign has kicked off following some recent studies that show nine out of ten parents would like to spend more time helping their child improve their reading and writing skills, yet one child in three does not own a book.